Only the strong(est) will win. Not gonna be that guy. Brotherhood of the Wolf is an odd bird, and quite definitely by design. It’s a French-language period drama action horror story about how a naturalist knight, his mystical karate Indian pal, and an Italian prostitute/Vatican assassin unravel a conspiracy involving a zealous cult’s use of an armored monster to spread anti-Enlightenment propaganda. It is, of course, based on a true story. It’s completely ridiculous and totally awesome. I wish there were more like it. Mani, an Iroquois warrior/shaman who’s left America to become the companion of the film’s main protagonist. Mani is friendly but taciturn, very spiritual, and an all-around good guy. His tragic backstory involves the white devil killing his tribe, before he linked up with the honorable Gregoire de Fronsac. He’s also the master of what looks a lot like Chinese wushu, which would have been tough for him to pick up in 18th-century America. It’s never discussed, so the implication may be that kung fu is indeed yet another one of the magic foreign powers that American Indians know (the movie really does have that level of willful silliness) or, as later revelations in the story might allow for, that he actually learned it from Fronsac (who presumably picked it up on his many travels). Played by Mark Dacascos, who never got to be as big a star as he should have. 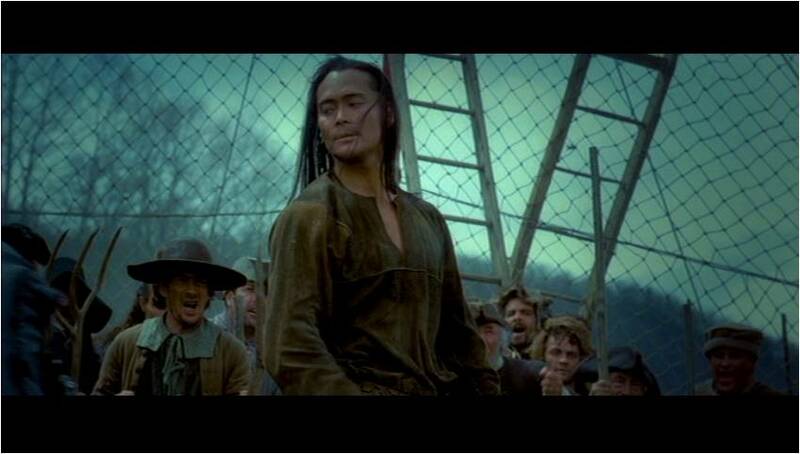 It’s funny that Dacascos should play a Native American, since that’s one of the few ethnicities that’s not somewhere in his rich genetic gumbo. Dude’s like the Tiger Woods of violence. French soldiers, about six of them. They’re all dressed up and nowhere to go like peasant ladies because, as we will later find out, the beast tends to attack females and the local magistrate is trying to draw it into a trap. Anyway, they’re tough & mean, but nobody short of Jet Li is a match for this karate Indian. Played by stunt men, presumably. 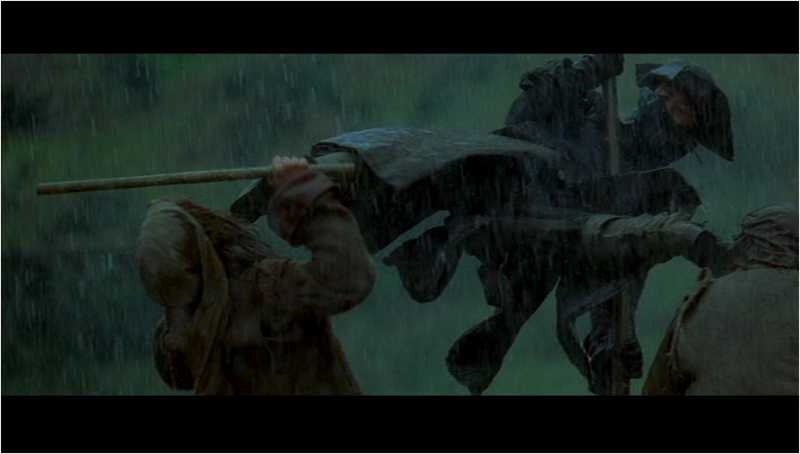 Everybody has wooden quarterstaffs. Well, Mani doesn’t at first, but he fixes that right quick. The Setup: The king has sent his royal taxidermist to the province of Gevaudan to investigate a series of killings attributed to a mysterious “beast” stalking the countryside– the first thing we see, actually, in full-on horror movie style, is a poor woman get devoured by the elusive creature. It’s a dark and stormy afternoon, with precipitation that Forrest Gump would describe as “big ol’ fat rain,” as our heroes arrive in town. They immediately come across the nasty sight of a bunch of thugs beating up not just a nice old man but also a young pretty girl, which is a twofer in the realm of “excuses to show how tough the hero is” cliches. The conflict is, we will learn afterward, about the soldiers’ refusal to pay the old man for medicinal services rendered to their horses (the girl, his daughter, has probably also instigated it to some extent, considering how much of a troublemaker we later learn she is). Though the soldiers demand to know who these two strangers are, neither answers. Mani dismounts and casually strides into the group like a boss. The Fight: It’s pretty clear that Mani means business, so the soldiers waste no time surrounding him. One charges in tentatively and gets rewarded with a kick to the gut, and Mani stealing his weapon. And from there on, it’s Mani’s world, and these skirted chumps just live in it. Nobody even comes close to grazing the Iroquois as he dispatches them all with ease. Since what they’re doing is not too complex, for the most part Dacascos doesn’t even have to show off some of his fancier kung fu– he just moves fast & hits hard. They also mostly try to rush in one at a time, but everything happens so fast, and Mani’s so unpredictably graceful, that you can’t blame them for not thinking to all rush in simultaneously. As we’ve discussed again & again here, it’s the opening fight scene’s job to introduce what kind of movie we’re going to be watching, and BOTW definitely lives up to its end of the bargain there. In addition to the choreography by Phillip Kwok, director Christophe Gans announces his aesthetic intentions early on. The staging is melodramatic & hyper-stylized: the action speeds up & down to emphasizes hits & motion, blows are accompanied by loud crunches on the soundtrack, and even the raindrops splash out in glorious slow-mo. This film is one of the many to clearly live in the shadow of post-Matrix kung fu films, but still recognizably have its own style. Anyway, Mani makes quick work of these chumps with several elegant hits. 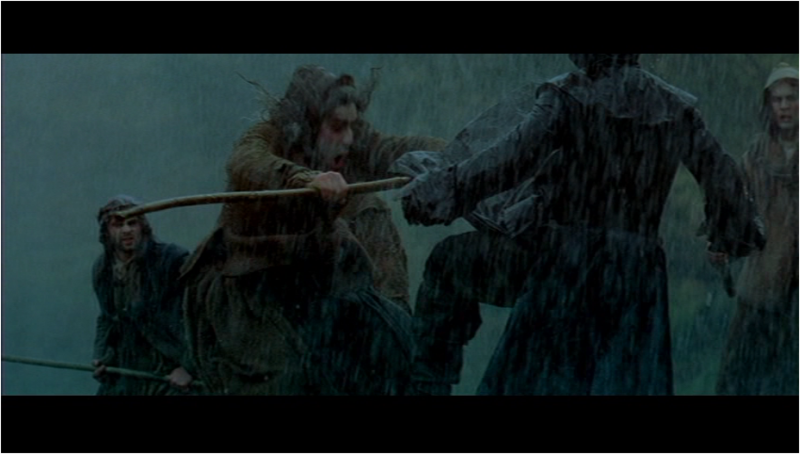 The last is the most notable, when he plants his staff and launches himself into the air for sweet double-kick. After that, even the ones who aren’t too beat up to fight decide it’s time to give up on this one. The dispute is “settled” and the heroes have made some new enemies, although it’s the people they saved who they should be worried about. This is a lot of fun, and it sets the baseline for what we’ll be seeing throughout: Mani is not to be trifled with, and Gans came here to play. Coming Attractions: Someone trifles with Mani. Oh! That’s the chairman from Iron Chef! I’ve never heard of this movie before. Will look into it further. It’s very good & cool. I’ve never seen Iron Chef but I knew Dacascos was on it. Glad he has steady work but it seems to me that being the judge of a cooking show is a waste of his physical talents. He also had been showing up on the new Hawaii Five O (I haven’t watched since the 2nd season, not sure if he is still there). Much better acting in that vs Iron Chef. Dacascos is off the charts in a film called Drive (not that one). Hopefully a review of that film is on the list in the future! Drive is really fun, a shame it never got any serious distribution. Maybe one day I’ll get to it.